The coast of Cornwall is one of the most dangerous stretches of water and there are a thousand recorded wrecks resulting in the greatest concentration of lighthouses anywhere in the world. In the days of sailing ships the surfing beaches, narrow coves and spectacular cliffs enjoyed by holiday makers today were threatening dangerous places where an unwary ship could be wrecked almost in an instant. We pray Thee Lord, not that wrecks should happen, but if they do Thou wilt guide them to the Scilly Isles for the benefit of the poor inhabitants. Trinity House since 1514 has been responsible for the safe passage of sailors around the coasts. 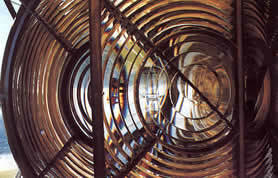 Before the 19th century the only lights on the Cornish coast were the Eddystone, Lizard, St Agnes and first Longships. In the 19th century lighthouses were constructed at Bishop Rock, Longships, Wolf Rock, Round Island, Eddystone, Trevose, Godrevy and St Antony. These were built by local labour under the supervision of Trinity House engineers. In the 20th century Pendeen, Tater Du and Peninnis were added. The Wolf Rock Lighthouse was begun in 1862. All the stones were precut and shaped on shore in Penzance and trial fitted before being transported by barge to the construction site. Here a look out kept watch in the early stages for possible heavy swell which would submerge the work and the men had to hold on whilst it washed over them. Trevose Head Lighthouse - built in 1847. Situated some 4.5 miles from Padstow. 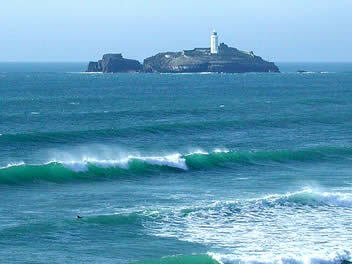 Godrevy Lighthouse - built in 1858 on Godrevy Island in St Ives bay. Pendeen Lighthouse - built in 1900 on Pendeen Watch headland. Seven Stones Lightvessel - anchored 15 miles WNW of Longships Lighthouse. Longships Lighthouse - first built in 1795 1.5 miles out from Land's End. Wolf Rock Lighthouse - first beacon built in 1795 8 miles from Land's End. Round Island Lighthouse - built in 1887 2.5 miles north of St Mary's. Peninnis Head Lighthouse - built in 1911 on the southern tip of St Mary's. St Agnes Lighthouse - built in 1680 used until 1911. Bishop Rock Lighthouse - first started in 1847 on an isolated rock SW of Scilly Isles. 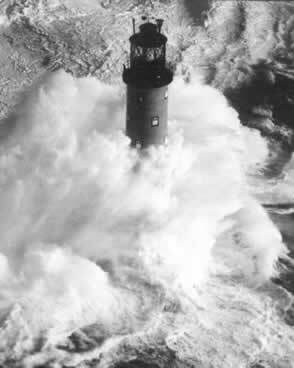 Tater Du Lighthouse - built in 1965 near Penzance. Lizard Lighthouse - first built in 1619 at the end of the Lizard peninsula. St Anthony's Head Lighthouse - built in 1835 at entrance to Falmouth harbour. Eddystone Lighthouse - first built in 1698 8 miles off Rame Head. Originally lighthouses were built to be manned but more recent ones were automated from the start. Now there are no manned lighthouses in Cornish waters.